One of the things I didn't mention last week when I told you about the Pie Party and my Braised Pork Mofongo Tart, is that I initially meant to make two pies to bring to the party--my savory pie, and a second sweet banoffee pie with dulce de leche, bananas, and whipped cream. I made the dulce de leche the night before, but ended up running out of time and never finished the pie. I decided I wanted to use the caramel in some kind of bread. 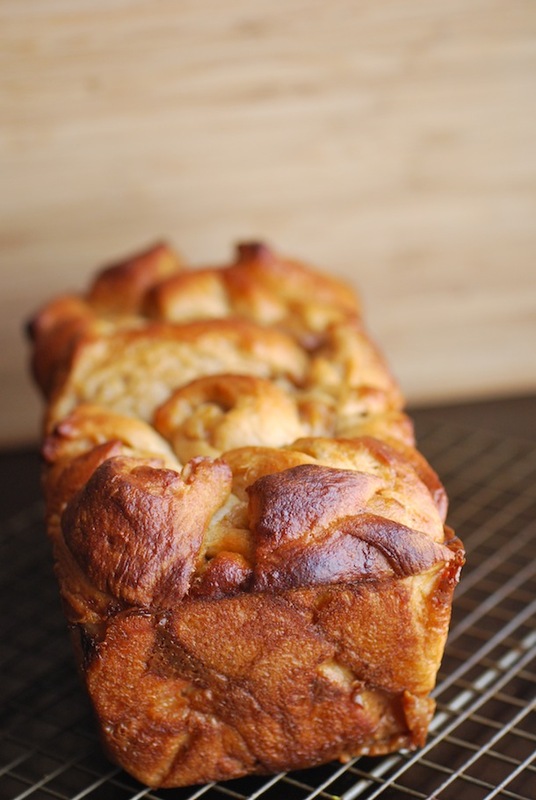 I was thinking a monkey bread, but while browsing around on Tastespotting I came across a gorgeous photo of a Caramel Apple Chopped Bread by the blogger Seasons & Suppers. The photo pulled me in, but I was particularly intrigued by the method of "chopping" the dough after stuffing it--basically attacking it with a knife and hacking it into multiple small chunks that are then tossed into the loaf pan and allowed to bake into themselves. Especially when the result is a gorgeous loaf with a craggy top, just perfect for slicing or (my favorite) pulling apart in warm, delicious nuggets. I was sold! I had to try the bread right away and decided to give it a shot with my dulce de leche and poached pears. I changed the recipe around a bit, too, using warm milk to bloom my yeast and adding sugar and cinnamon to make the bread itself a bit sweet. The PERFECT breakfast bread recipe! I took photos of the process to give you a better idea of how it goes. You start off pretty normally by letting the dough rise. While the dough is rising, take the time to poach your pears and make your dulce de leche (or just use your favorite storebought caramel sauce--I LOVE this goat's milk caramel from Fat Toad Farm). And fold the dough over once. Then again into a chubby little package. And now you CHOP!!! This part gets a little messy. Now toss all those lovely chunks of dough and caramel and pears into your parchment-lined loaf pans. Only fill them about 2/3 of the way full so the bread has room to rise. You can make two large loaves or four mini ones. I made one large loaf and two mini ones. (We ate the mini ones almost immediately after they came out of the oven.) Let the dough rise until it reaches the top, then brush with an egg wash and bake about 45 minutes. Let it cool in the pan a bit before pulling it out. This is best served just a little bit warm, but it's also lovely sliced and just a little bit toasted. (I recommend salted butter.) I love how the poached pears become all soft and jammy, and the dulce de leche adds little bits of toffee-like sweetness throughout. Make the dough: Whisk together the yeast, milk, and sugar in the base of your electric mixer and let sit 5 minutes. Add the flour, cinnamon, melted butter, and salt and combine with the dough hook. Let knead for 5 minutes until the dough is smooth and not sticky. If the dough is too dry, add another splash or two of milk. If it is too wet, sprinkle in a little bit more flour. Form the dough into a ball and place in a greased bowl. Cover with plastic wrap or a clean towel and let rise 1 hour or until doubled in size. While the dough rises, combine the pears, water, sugar, cinnamon sticks, vanilla, and lemon juice and zest in a large saucepan over medium-high heat. Bring to a boil and then lower the heat let simmer 20 minutes, or until the pears are tender. Turn off heat and let pears cool in the poaching liquid. Once the dough completes its first rise, dust flour on the counter and turn out the dough. Roll into a large rectangle, about 1/2" thick. Spread the dulce de leche (warm it slightly for easier spreading) over the surface of the dough. Remove the pears from the poaching liquid (Save the liquid! It's fantastic for cocktails!) and sprinkle over the dulce de leche. Fold the bottom half of the dough towards the center, then fold the top over the bottom two folds so that it forms one long rectangle. Fold in thirds again from left to right. Preheat oven to 350 degrees. Spray or grease the baking pans and line each with a piece of parchment paper that overhangs on the sides (so that you can pull the bread out easily once it's baked). Use a pastry cutter or a large chef's knife to chop the folded dough haphazardly into chunks (yes, this part will be messy!). Scoop the chunks of dough and pear into the prepared loaf pans, filling them each up to 2/3 of the way. Scrape up any remaining sauce and pears and pour them into the pans. Cover each pan lightly with plastic wrap and let rise 30 to 40 minutes, or until the dough rises above the top of the pan. Whisk together the egg and water and brush each loaf then place in the oven to bake for 45 minutes. Check the bread at 25 minutes and loosely tent each loaf with a piece of foil to prevent burning on the top edges. Let the loaf cool in the pan for 15 minutes, then gently pull out using the parchment paper, and let cool completely. If desired, serve drizzled with a bit more warm dulce de leche.